Personal, private, public. An invitation, an invasion. Performers include Marc Gagnon, Marie-Claire Gauthier, Pierre Gauvin, Mayi-Eder Inchauspé, Stephen Lawson, Marie Christine Lavallée, Heather Mah, Nathalie Mamias, Jean-Denis Olharan, Michael Toppings, Gary Varro and Sarah Williams. Michael Toppings is a language artist whose text-based works are rendered through the visual (installation, architecture), performing (performance, theatre) and literary arts (book works). His themes are dramatic and banal, tragic and bathetic, referencing social realism while inverting popular culture. 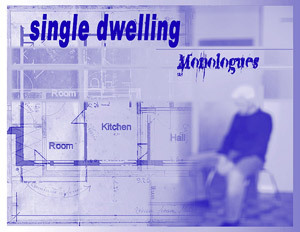 His interdisciplinary, multi-genre works that fuse narrative and gesture, portraiture and identity are research into the architecture of language (verb, adjectives, nouns) as it pertains to meaning and definitions – what a thing means and what it does not – that is to say “all definition involves exclusion; in determining exactly what a thing is, we thereby implicitly determine what it is not. To define a concept is to declare by one and the same act what it does mean and what it does not” (The Logical and the Translogical by Phillip Wheelwright). Michael Toppings’ extensive body of work include The Mathematics of God, The House Project, Male Herd, and The Manufacture of Zero. Aside from his own word-centric productions, Toppings is also a curator and programmer, and is a founding member of Petri’s Quadrille, a Saskatchewan-based arts/science collective.